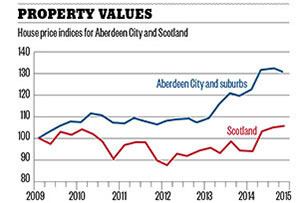 How has Aberdeen's economy been affected by falling oil prices? What does the oil price slump mean for the Granite City, where 100,000 people depend on the black stuff for their livelihood? Aberdeen has been riding a wave of black gold since the financial crisis. It has the highest concentration of millionaires and one of the lowest rates of unemployment in the UK. Some locals even talk of rebranding the infamously grey North Sea hub ‘Silver City’. 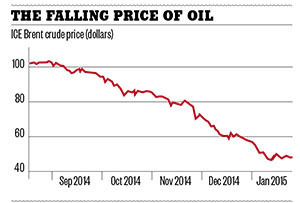 But the skies have been darkening over the granite streets since the oil price started tumbling last summer, from $114 in June to as low as $45 in early February. What Aberdonians don’t seem sure of is when the storm will break – and how bad it will be. 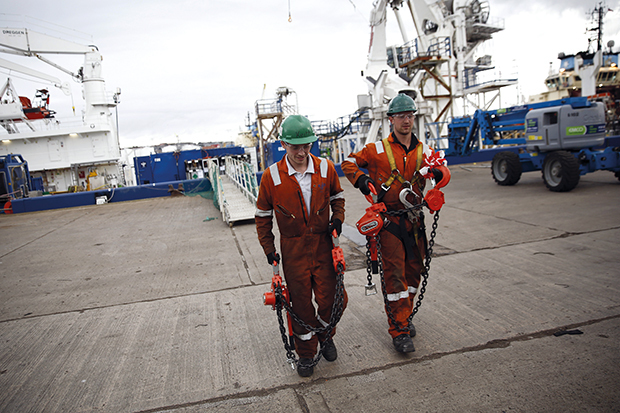 Oil majors including Shell, BP, Chevron and Conoco Phillips have already announced hundreds of mainly onshore job cuts. Those announced still number fewer than 2,000, but Sir Ian Wood, the billionaire former boss of oil services company Wood Group, has warned that could rise to 5,000 to 10,000 in Aberdeen. The industry supports 100,000 jobs in a city of 227,000 people – and as many as 400,000 across the UK. ‘We all can sense people are spending less and travelling maybe one day less, but I don’t think we’re in doom and gloom yet,’ Roula Samaha, the elegantly manicured general manager of the 79-room Malmaison Hotel, tells me in the gothic-themed bar overlooking the wealthy West End of Aberdeen. But occupancy has slipped – it’s ‘in the 80s’ now, instead of 100%. The barman at the Marriott opposite BP’s offices near the airport says business is still good – but oil workers have tightened the purse strings. As oil flowed, house prices almost doubled in the decade to 2014, according to official Registers of Scotland data, by far the biggest increase in the country. Rent for a two-?bedroom property soared 40% between 2010 and 2014, more than double the increase anywhere else in Scotland, according to Lettingweb. That’s probably partly due to buyers racing to avoid a rise in Scottish stamp duty on pricier granite mansions due in April, he admits. And the most recent official figures show home values falling 1.1% in the third quarter of last year, having surged 7.8% just three months earlier. But while ‘rents peaked in October’, Eduardo Prato, the director of lettings specialist Martin & Co and a part-time helicopter pilot, senses an opportunity. ‘A lot of people are panicking and putting properties on the market,’ he explains. Plenty won’t get the prices they want and so many will become ‘accidental landlords,’ helping soak up the excess demand. ‘We never, ever chase tenants at all, ever,’ he says. And what about commercial property? 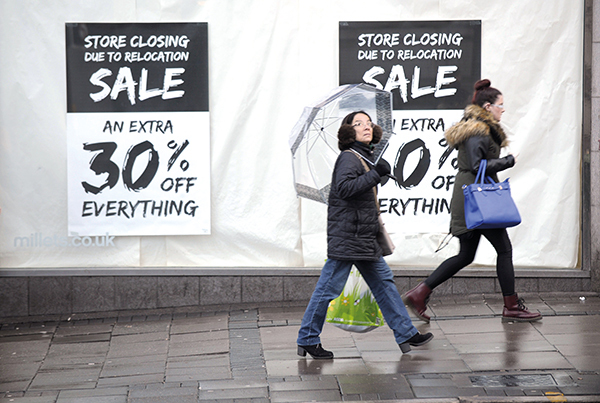 ‘There is no lull in the market,’ Angus MacCuish, the managing director of property consultancy FG Burnett, says emphatically. A million square feet of offices were filled last year, a record for the city, including the second largest deal in the UK. And there are already discussions going on with potential tenants about four large new offices being built in the city centre. Aberdonians are keenly attuned to oil prices and everyone I spoke to thinks the UK government should stop raising taxes at the drop of a hat. 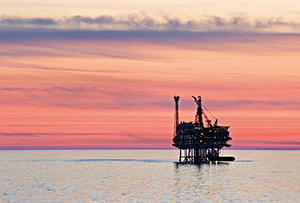 Wood is merely the most vocal in calling for politicians to increase incentives to keep investment in what is an increasingly aged offshore basin – and the most expensive in the world, according to industry body Oil & Gas UK. The 10% cut Wood is calling for in the 18 March Budget, ‘frankly won’t have any real impact at $50, because at $50 very few people are paying tax’, he says. But it ‘will encourage more operators to hunker down’ and commit to extracting the remaining 15 to 24 billion barrels of oil and gas. But Wood is among those warning the North Sea may not rebound as strongly as in the past, as the 40-odd years’ worth of oil and gas left is increasingly difficult and costly to get out. The city’s energy expertise will no doubt keep it rich for some time yet (or at least until the world gets serious about climate change), despite this latest oil price pasting. As Collier points out, some 50% of the hub’s business is now exports. But one thing is clear – Aberdeen’s streets are not paved with silver.